From the previous lesson you have found your trading opportunity. In this lesson, you will learn that this opportunity only becomes an actual trade if a certain price level is reached. Instead of waiting in front of your screen for that price level to be reached, you can use a pending order. A pending order is a potential trade that will automatically trigger, but only if the price level that you have chosen has been reached. When you have determined that the market direction is up, then you will look to enter a "pending buy stop" order. In order to do so, you will need to set your entry price, stop loss, profit target and position size. You must make sure that before and after you have entered your pending order that you check for any news that can be released that may affect your trade. If there is any news or reports that are due to be released then you should not place a trade. News and data releases can cause volatility to greatly increase and change the market direction suddenly or cause the trade to hit your stop loss. If you are already in a trade you should close your trade 5 minutes before a news event as this will help reduce your risk significantly. Find the last up fractal, place a line at the high of the price just below the fractal. This line is the price at which you will enter the market and hence, the entry price you enter into your pending order. 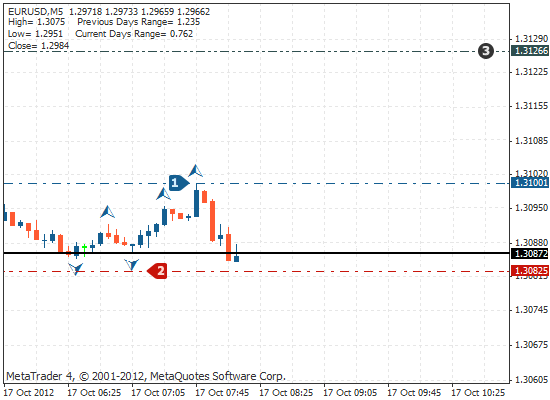 The blue line in the chart below shows the price you will enter for your pending buy stop order in MT4. When the price gets to this level, the pending order will automatically enter you into the trade. Find the last down fractal and place a line at the tip of the fractal — this is where your stop loss will be. The red line in the following chart shows the price where you will enter your stop loss. Find the next pivot point up from the entry on your chart — this is the profit target. The green line shows the price you will enter for your profit target. At midnight, the pivot points change. The new day will have a new set of pivot points based on the now previous day's data. 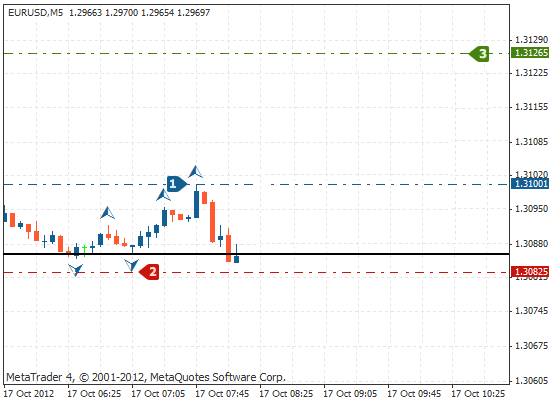 In this event you will have to adjust your profit target to the next new pivot point up. New pivot point up - this is where you would need to adjust your stop loss too. For every $100 that you have in your trading account, you should trade 0.01 lots rounded down (based on trading a major currency pair, with the USD as the quote currency). For example, if you have $450 in your account, you would trade with a volume of 0.045 which you would round down to 0.04. If your account is denominated in a currency other than US dollar, then simply calculate the equivalent amount of US dollars in your account using the current exchange rate and base your position size on that. Now that you have entered the pending order, move to the next step in order to manage it. See next lesson. When you have determined that the market direction is down, then you will look to enter a "pending sell stop" order. In order to so, you will need to set your entry price, stop loss, profit target and position size. Find the last down fractal, place a line at the low of the price just above the fractal. This line is the price at which you will enter the market and hence, the entry price you enter into your pending order. Find the last up fractal and place a line at the tip of the fractal — this will be where your stop loss is. The red line in the following chart shows where you will place your stop loss. Find the next pivot point down from the entry on your chart — this is the profit target. The green line shows where you will place your profit target. At midnight, the pivot points change. The new day will have a new set of pivot points based on the now previous day's data. 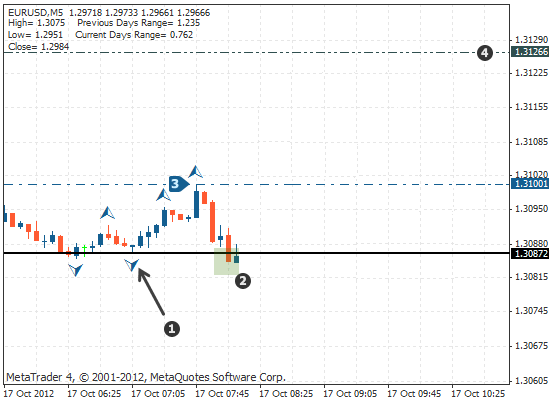 In this event you will have to adjust your profit target to the next new pivot point down. New pivot point down - this is where you would need to adjust your stop loss too. For every $100 that you have in your trading accout, you should trade 0.01 lots rounded down (based on trading a major currency pair, with the USD as the quote currency). Never leave your trades open over the weekend. 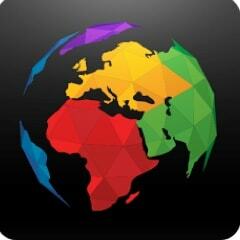 If you still have an open order on Friday at 18:00 GMT, close your trade.